The prevalence of diabetes worldwide is rising continuously; simultaneously, the prevalence of diabetic retinopathy and vision-threatening diabetic retinopathy (VTDR) is also anticipated to increase drastically. However, early detection and treatment can reduce the risk of blindness by 95%, while diabetic retinopathy often lacks early symptoms, people with diabetes should get a comprehensive dilated eye exam at least once a year. Optical Coherence Tomography (OCT) systems are designed and manufactured with high-precision optical metrology systems for 3D non-contact inspection and imaging, for instance, Agfa HealthCare launched “SKINTELL” i.e. non-invasive high-definition Optical Coherence Tomography solution that offers very fast, comfortable solution for visualizing skin morphology and measuring dimensions in the skin layers. Goldstein Research analyst forecast the optical coherence tomography market size is set to reach USD 1.72 billion by 2025, at a CAGR of 7.5% over the forecast years. Presence of accessory provider companies i.e the aftermarket of OCT devices and a strong network of distributors and suppliers in the market are the growth drivers of the market. The report covers the present ground scenario and the future growth prospects of the Optical Coherence Tomography market for 2017-2025 along with the data of installed OCT in hospitals, CATH labs and other medical facilities worldwide. We calculated the market size and revenue share on the basis of revenue generated from major players across the globe. The Optical Coherence Tomography Market is forecasted on the basis of revenue analysis, product benchmarking and strategic developments of key market players. The report also includes micro and macro factors essential for the existing market players and new entrants along with detailed value chain analysis. Based on application, ophthalmology segment spearheaded the optical coherence tomography market in 2017 with the market share of 46%, whereas, introduction of other applications like dermatology imaging is expected to witness lucrative growth i.e. at the rate of 7.85% over the forecast period due to the ability of OCT imaging devices to non-invasively provide 3D images up to 2-3 mm depth with higher resolution than ultrasound. Global Optical Coherence Tomography Market 2017-2025, has been prepared based on an in-depth market analysis from industry experts. The report covers the competitive landscape and current position of major players in the Optical Coherence Tomography Market. The report also includes porter’s five force model, SWOT analysis, company profiling, business strategies of market players and their business models. Global Optical Coherence Tomography Market report also recognizes value chain analysis to understand the cost differentiation to provide competitive advantage to the existing and new entry players. 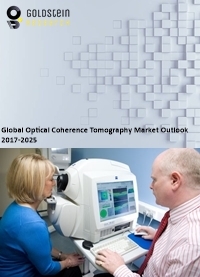 Our global Optical Coherence Tomography Market report comprises of the following companies as the key players: Carl Zeiss Meditec AG, Topcon Medical Systems Inc., Optovue, Michelson Diagnostics Ltd., Heidelberg Engineering GmbH, Novacam Technologies Inc., Agfa Healthcare, Imalux Corporation, OPTOPOL Technology S.A, Leica Microsystems, TOPCON, Agiltron, DermaLumics, Insight, Moptim, NinePoint Medical, Oztec, PhotoniCare, Santec, Terumo, Tomophase, Thorlabs, St. Jude Medical and Thorlabs Inc. According to the report, major driving factor is the increasing intensity of prevalence of both diagnosed and undiagnosed diabetes. In 2015, an estimated 23.1 million people or 7.2% of the U.S. population had diagnosed with diabetes and currently, about 60% of people with diabetes have yearly screenings for diabetic retinopathy. Further, the report states the biggest challenge is the lack of reimbursement facilities and insufficient clinical data might impede the growth of the Optical Coherence Tomography (OCT) market. Based on geography, North America with 35% market share in 2017 followed by Europe are the leading markets for Optical Coherence Tomography (OCT) owing to growing rate of supply of OCT imaging by manufacturers to hospitals to improve their brand image and expand product reach. Asia Pacific region is the fastest growing region and tends to hold over 24% of the market share by 2025. Presence of growth opportunities in regions such as Korea, China, India, Malaysia and others countries of South Asia are expected to be the vital impact rendering drivers. Furthermore, expansion of competitors and establishment of manufacturing units in the region while to increase efficiency, hospitals increasingly adopt OCT system for the diagnosis of diabetic retinopathy, cardiovascular diseases, and dermatology.